I'm concerned they're not super healthy for breakfast. my pancakes always turn out ugly. Apparently I am unable to cook pancakes and have them look pretty. 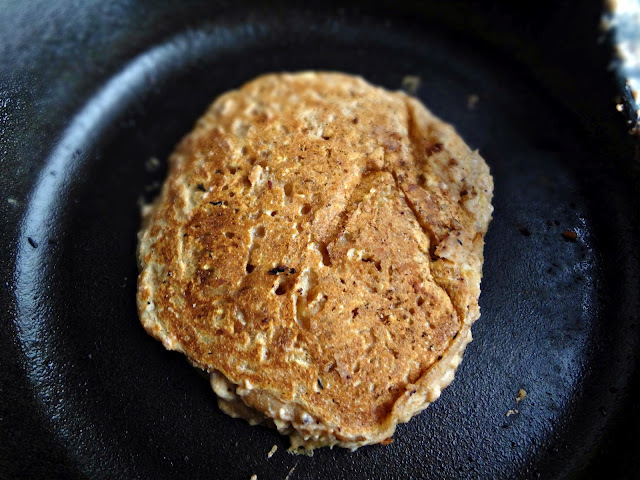 These pancakes are fat free, vegan (if you use vegan or no chocolate chips), low in sugar, and absolutely tasty!! They're another new fav. breakfast of mine (and I like to make them in my little cast iron skillet that my sweetie got me for Christmas). I actually had some yesterday. 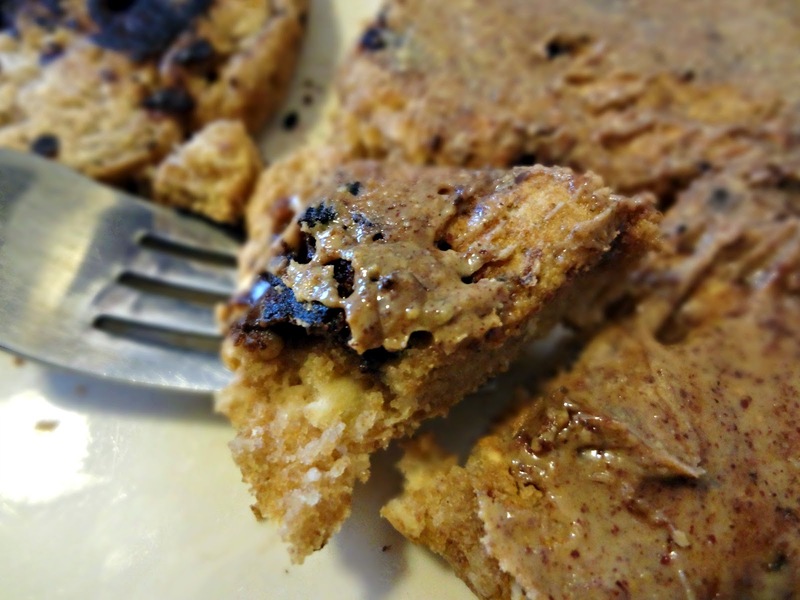 So go forth and eat guilt-free pancakes (that taste like cookies)! 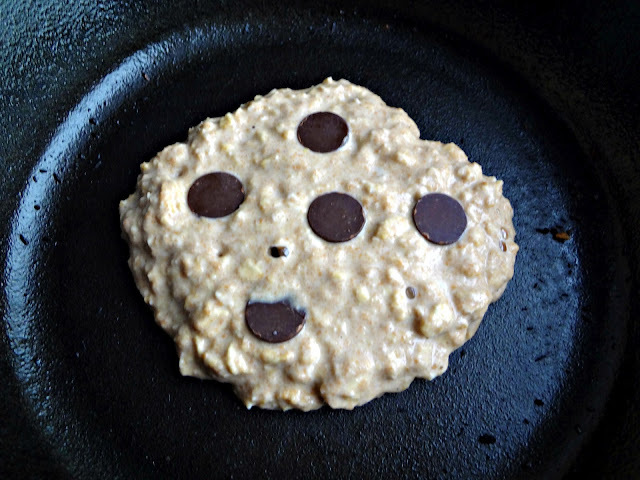 Adapted from Chocolate Covered Katie's "Chocolate-Chip Cookie Dough Pancakes"
Serves 1-2. Depending on how hungry you are. Add water slowly, until desired consistency. Cook in a (greased) skillet over medium-low heat. Add chocolate chips as one side cooks. When bubbles break towards the middle, flip. Cook until the other side is golden brown. Serve warm with syrup, butter, or (if you're me) peanut butter! Here...have a bite. It's OK-they're healthy! 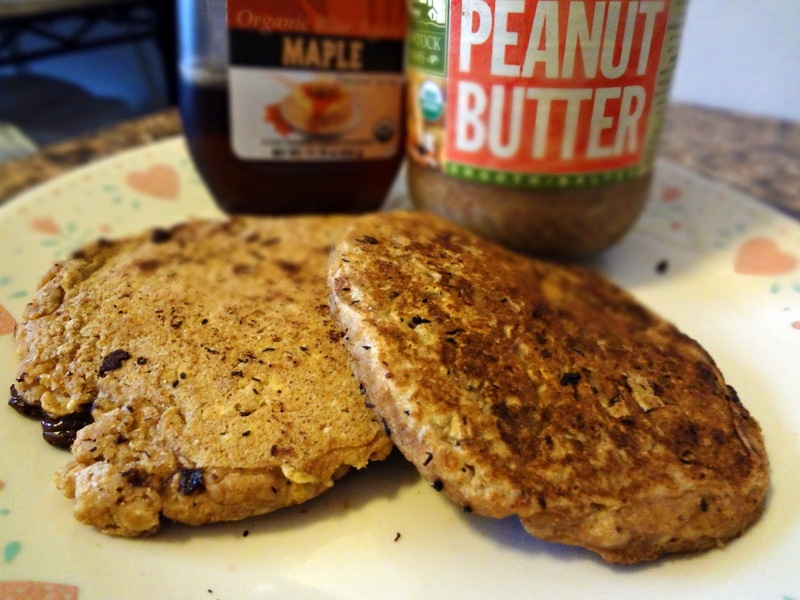 Pancakes that taste like cookies, and they're healthy- score! They look awesome and so pretty. Job well done, Kayle. Can't wait to try these for breakfast this weekend before my bike ride. Thanks for sharing. YUM. Omg YUM. Carbs are the death of me. Yummy!!! That looks like one great pancake! I'm lovin' on your pancakes, girl. These look delicious! You could always add in some ground flax to make them even healthier! Always love reading your recipes, lady! oh man these look AMAZING! i can't believe they are healthy, awesome job! I love whole grain pancakes and that touch of chocolate sounds like a great addition. Also, I would not reserve them just for breakfast, they would fare well as a dessert with ice cream. Well done-yum! Enjoy the weekend! Hi, Kayle. I made these pancakes this morning. They are delicious. Also, they were super simple to whip up. I was half asleep when I made them this morning. I'm eating them as I type and they are so tasty. Thanks for the lovely recipe. I have the same problem--these come out super easy for some reason! Thanks to Javelin Warrior, I found this page and just tried these pancakes. They tasted very good even with me messing up and adding more wheat flour than it called for! LOL.. my mistake - can't read directions. I didn't have any chocolate chips on hand, so I added a little cocoa powder and cinnamon. What can I say, Momma never taught me to not play with my food; I'm glad she didn't! Warm vanilla, brown sugar, cinnamon chocolate and oatmeal. What a combination! Aw good!! That sounds amazing!